Bali Traditional Tour Tanah Lot is one of the famous tourist attraction with beautiful sunset. 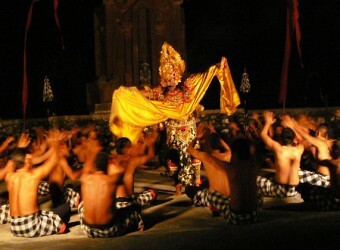 After sunset ended, there is a show that can be enjoyed by tourists in Tanah Lot that is the Kecak Dance Show. Kecak dance is played mainly by men, where the number of players in the tens or more dancers who sit in line and a circle with a certain rhythm voices calling for "cak", raising his hands. The Temple is Also Beautiful! It’s a very famous temple so I thought I must go there. There are a lot of souvenir shops in this tourist attraction. I thought it was good to watch traditional Balinese dance here from evening! It’s wasteful if just visit the temple.